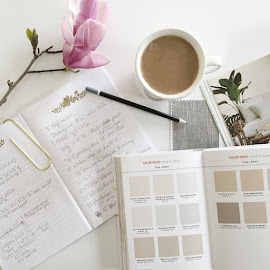 now that you've seen what our kitchen looks like, and our very real budget, let's spend a few minutes indulging fantasy. 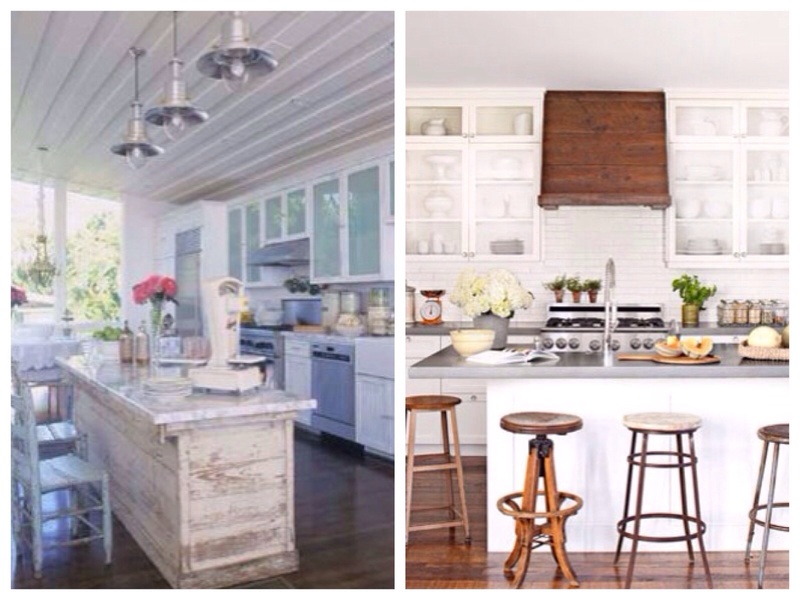 here are some beautiful and inspiring kitchens that i just had to share with you before we left the topic. (don't worry, it will only be a temporary pause. 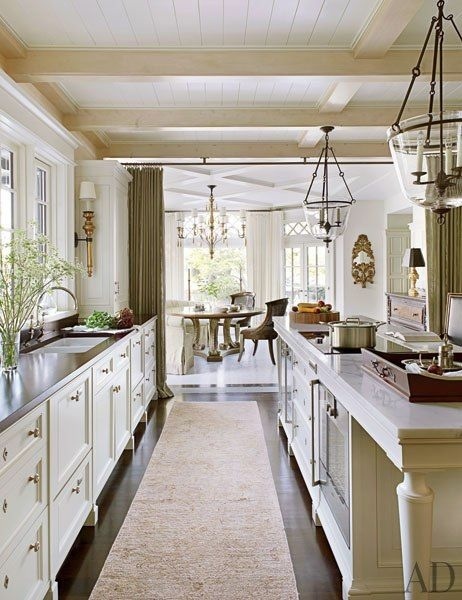 i can't stay away from the subject of kitchens for long). 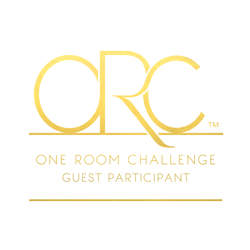 i'm never happy with rooms that turn out looking too polished. the distressed and rustic elements here keep that from happening. from alkemie (left) and country living (right). 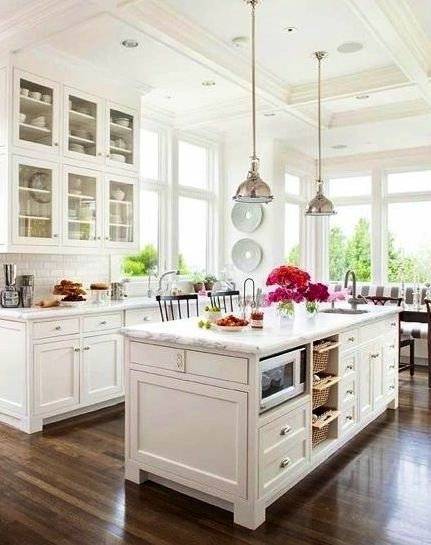 this kitchen is still one of my favorites of all time. 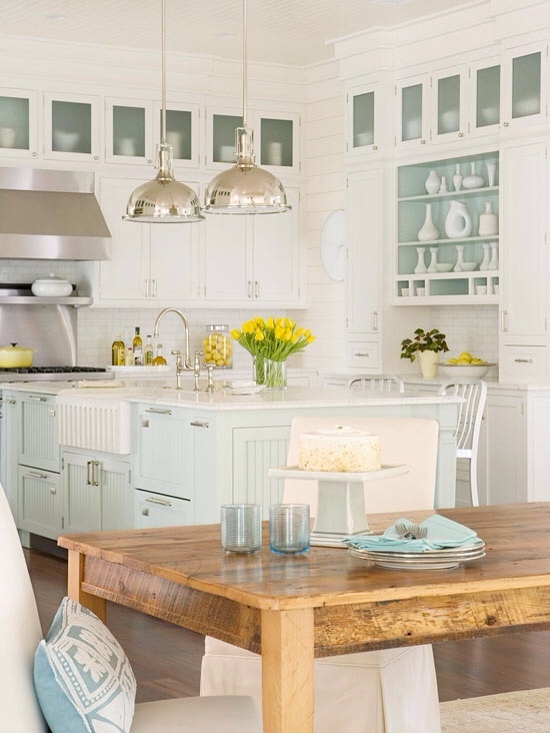 it is the farmhouse kitchen by sarah richardson featured on her show, sarah's house. 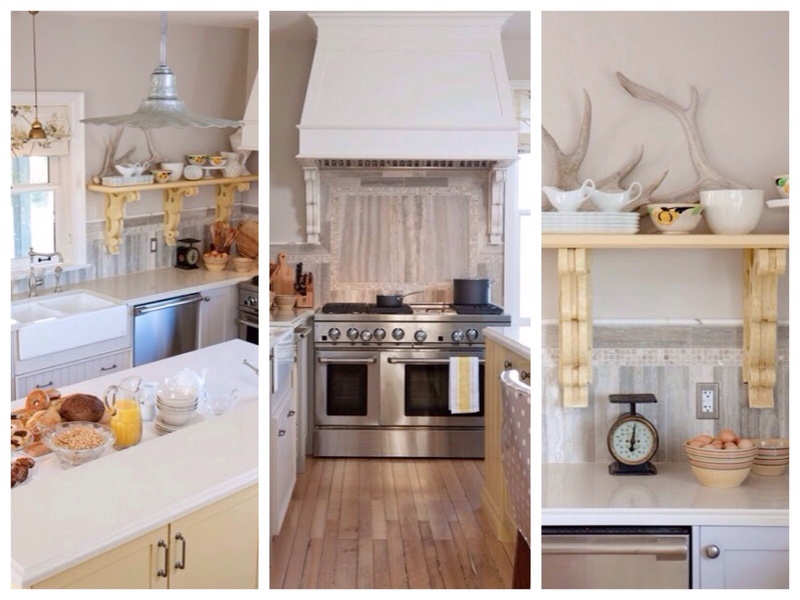 the yellow corbels, vintage accessories, distressed floors, and kenmore pro appliances are all must-have items on my dream kitchen list. 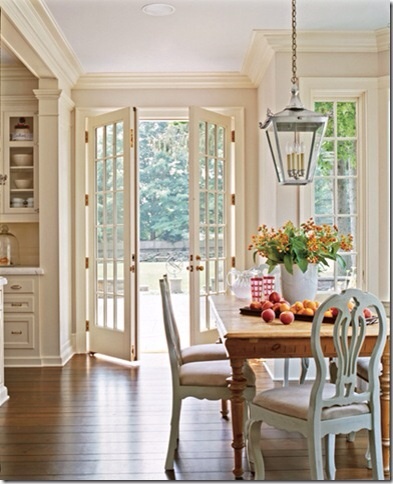 this eat-in area has beautiful french doors that open to a beautiful backyard. and light blue painted chairs! from traditional home. i apologize for the poor quality of this photo- its one of those you snap from a magazine before you force yourself to throw it away. 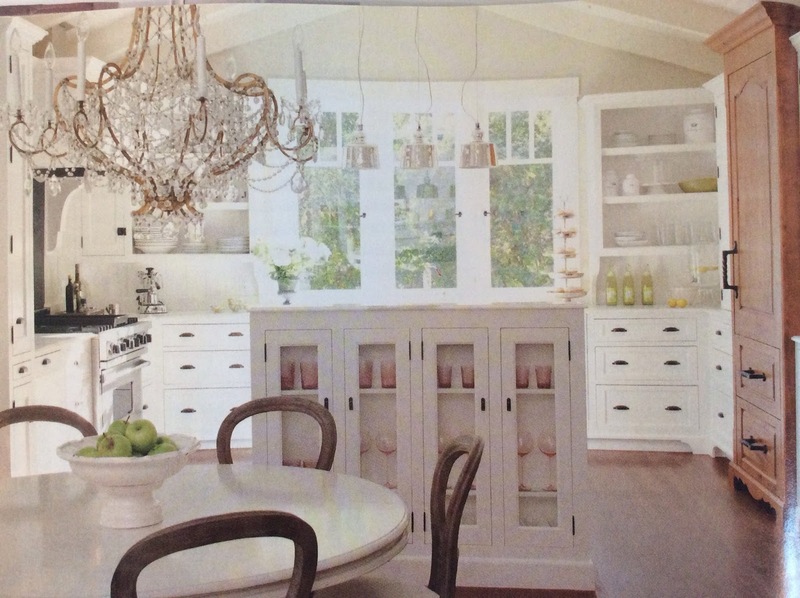 from bhg kitchen and bath ideas, october 2011.
this might be a bit too stark, but i really truly love it anyways, especially the industrial pendants and salvaged island and vintage appliances. from dustjacket attic. 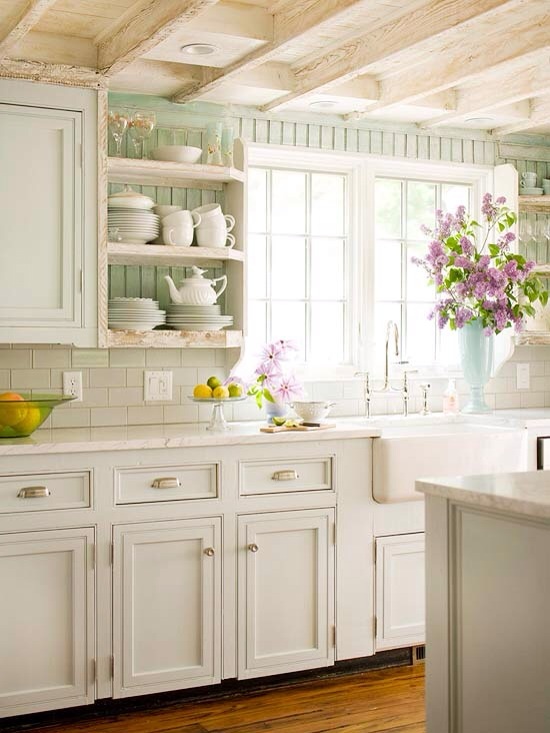 i remember seeing this in a magazine a couple years ago, and it inspired the robins egg blue color in the back of my cabinets. from better homes and gardens. this kitchen has it all- large island, marble counters, subway tile, a great ceiling, a breakfast banquette and gorgeous windows. its so bright and sunny. 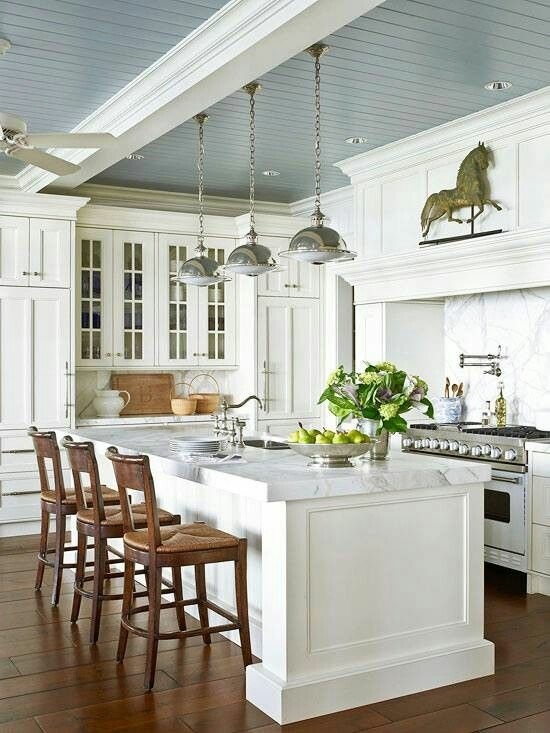 this kitchen inspired our beam and beadboard ceiling. i've had the page ripped out from a magazine and tacked to my bulletin board since we moved in. unfortunately, i tossed the rest of the magazine so i can't tell you the source! 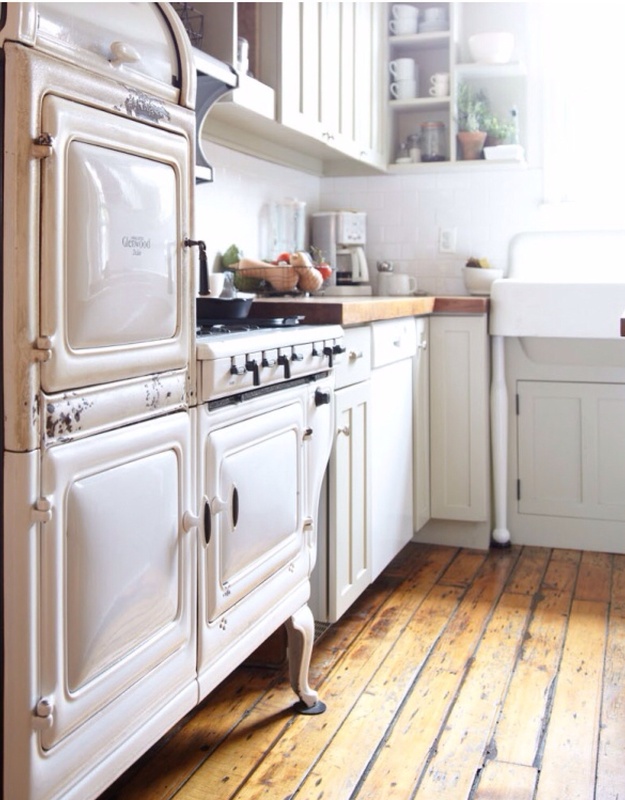 twenty years after its time, i'm sure someone thought this vintage stove was an eye sore. but now its glorious. you see? there is hope for mine. 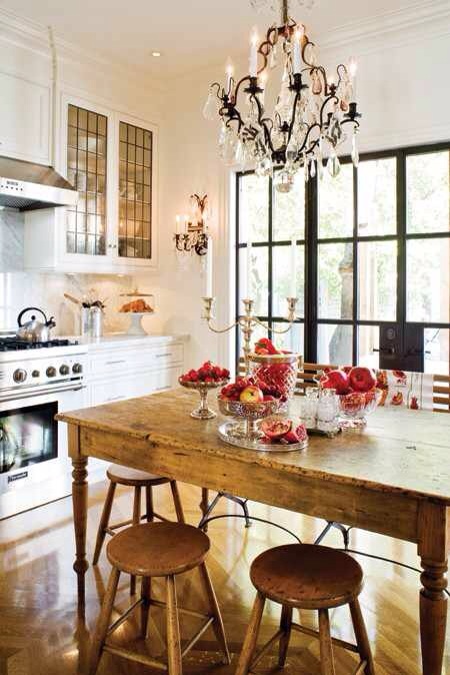 i'm a fan of how this kitchen mixes antique and modern, rustic and glam. i'm also starting to reeeaaally like black window muttons. mutton. that's a horrible word. is there a better one for those things? image from free house interior design ideas. see how these cabinet doors fit inside their frames? that's the kind i want. spotted at mix and chic. are two islands a little overkill? nah. from veranda. 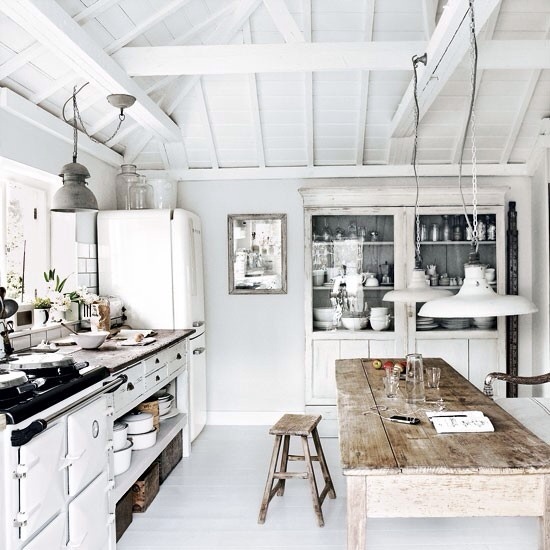 this kitchen is too grey, perhaps, (as my husband often says, "are you sure it doesn't have too much color? 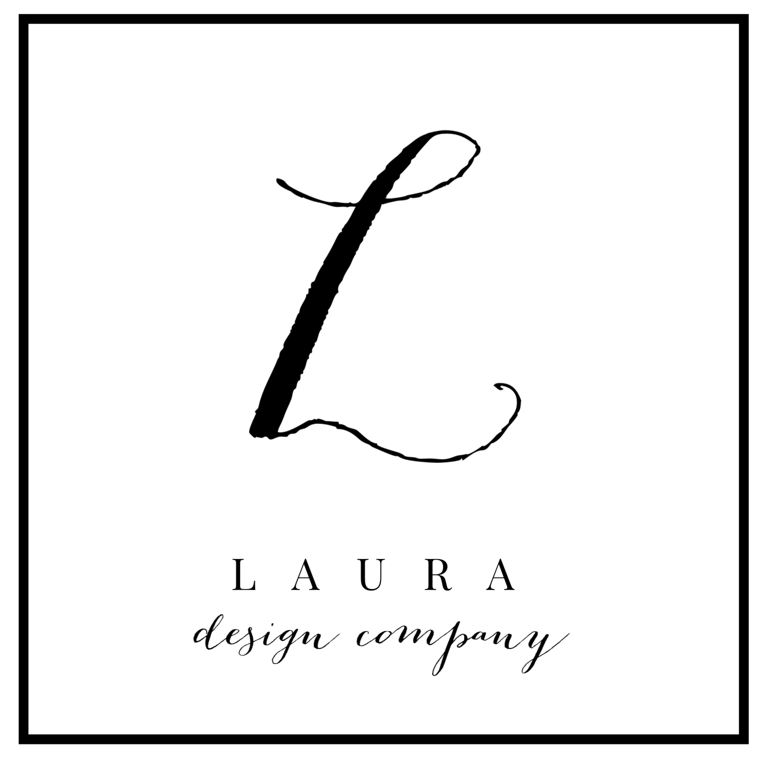 "), but the layout is perfect. 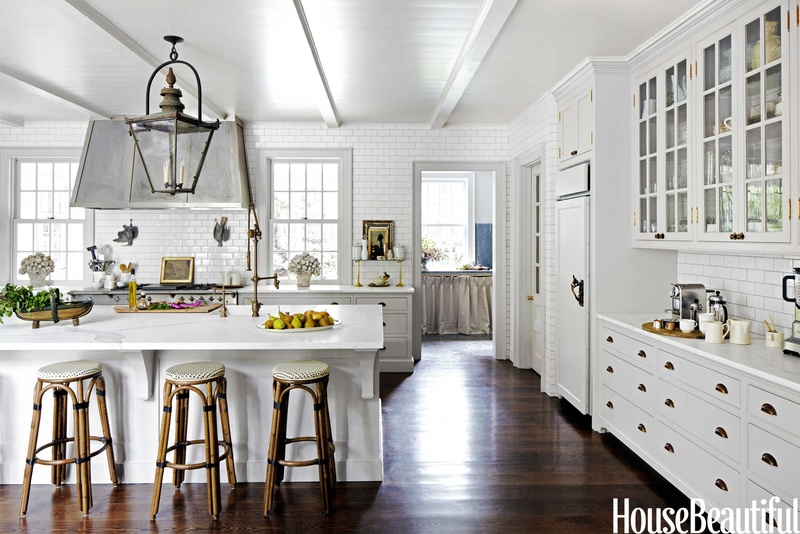 and i love the wall of cabinets on the right. 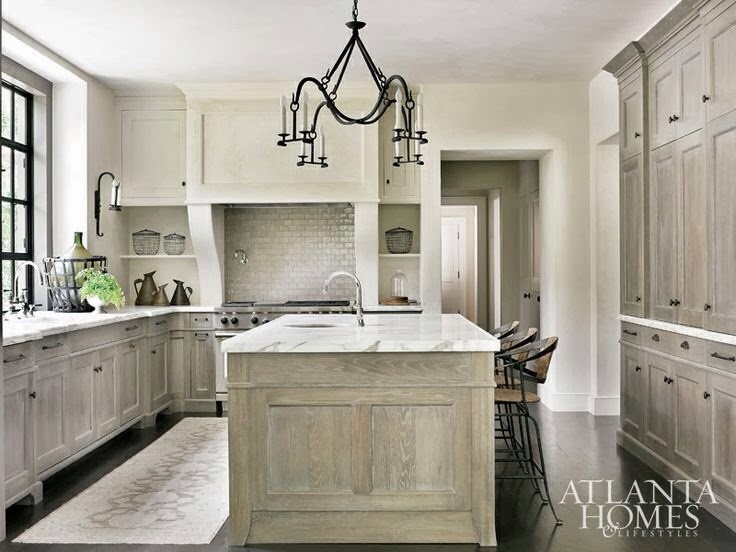 from atlanta homes & lifestyles. ginormous window behind a farmhouse sink. sigh. 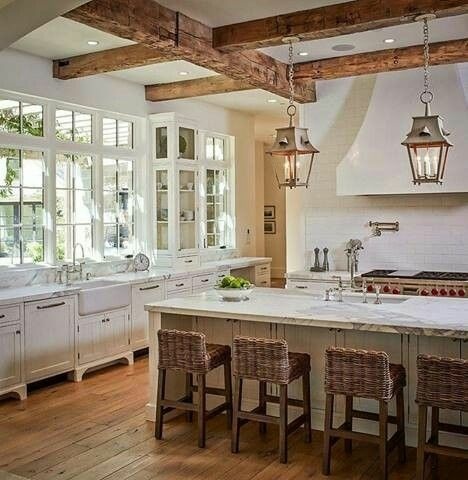 and those ceiling beams and lanterns are incredible. well, there you have it. some of my favorite kitchens. if the daydreaming ended too soon for you, there's more to be found on my kitchen board at pinterest.